Many of the hand-made honey cosmetics below are made using our family recipes dating from 1924 onwards. Just simple fresh wholesome ingredients with a few bits collected by our bees! 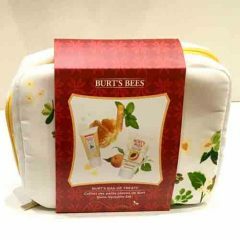 Discover the best nature has to offer with Burts Bees Burts Bag of Treat gift set. Containing gently exfoliating Peach and Willowbark deep pore scrub, nourishing Milk and Honey body lotion and classic 100 per cent natural Beeswax lip balm for moisturised healthy looking lips all wrapped up in a beautiful travel sized wash bag. Burt’s Bees Soap Bark & Chamomile Deep Cleansing Cream is formulated with Soap Bark, a natural cleansing agent that effectively removes dirt, oil and make-up. Infused with Aloe Vera, Chamomile and Echinacea, it helps moisturise and soften your skin. – Removes dirt, oil and make-up with Soap Bark, a natural cleansing agent. – Helps moisturise and soften skin with Aloe Vera, Chamomile and Echinacea. Soap Bark – Derived from the Chilean endemic tree Quillaja Saponaria, Soap Bark is a natural soap, cleanser and foaming agent. Water, Helianthus Annuus (Sunflower) Seed Oil, Stearic Acid, Glycerin, Cocos Nucifera (Coconut) Oil, Cetearyl Alcohol, Polysorbate 60, Sodium Borate, Cetyl Alcohol, Silica, Glucose, Hamamelis Virginiana (Witch Hazel) Leaf Extract, Aloe Barbadensis Leaf Extract, Anthemis Nobilis (Chamomile) Flower Extract, Echinacea Angustifolia (Coneflower) Extract, Quillaja Saponaria (Soap) Bark Extract, Theobroma Cacao (Cocoa) Seed Butter, Rosmarinus Officinalis (Rosemary) Leaf Extract, Tocopherol, Citrus Medica Limonum (Lemon) Peel Oil, Coriandrum Sativum (Cilantro) Oil, Artemisia Dracunculus (Tarragon) Oil, Lavandula Hybrida (Lavandin) Oil, Jasminum Grandiflorum (Jasmine) Flower Oil, Xanthan Gum, Sucrose Stearate, Menthol, Glucose Oxidase, Lactoperoxidase. Back by popular demand! We make this 125ml body lotion from our family formula that has helped generations of men and women keep their bodies soft and protected. Made with a luxurious blend of essential oils, fresh royal jelly and our local sweet beeswax. Ours does not leave your body greasy like others. Ours absorbed into your body leaving them soothed and relaxed. Back by popular demand! We make this 125ml hand lotion by HAND! Yep our family formula that has helped generations of men and women keep their hands soft and protected from signs of ageing. Made with a luxurious blend of essential oils, fresh royal jelly and our local sweet beeswax. Ours does not leave your hand greasy like others. Ours absorbed into your hands leaving them soothed and relaxed. Yes the tin is new, but the true ole family recipe remains the same! 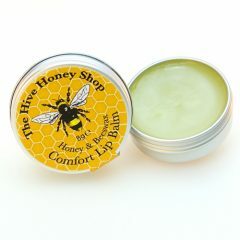 Our best loved honey lip balm now comes to you in this nifty neat (completely recyclable) screw top tin. Made with pure food grade English country, sweet beeswax with of course our raw pure English honey. It smells and taste so good you’ll be tempted to eat it! 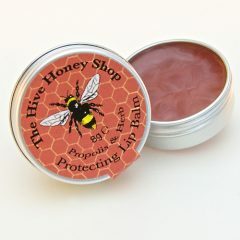 Propolis & Herb ‘Protecting’ Lip Balm Customers Rave about this one! Our lip balm is made using fresh herbs from our garden & many essential oils to produce a protecting lip balm. Our lip balm lasts a long time. Most customers lose it before they use it up! That’s about the only time we see them again for it. Propolis is collected by the bees from the bark and buds of trees and used in their hives to fight off bacteria and disease. It is naturally high in antiseptic properties. Yes the tin is new, but the true ole family recipe remains the same! 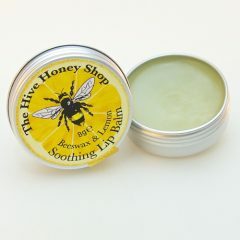 Our award winning lip balm is made with our very own pure sweet English beeswax. Lemon oil is its only scent. There are no artificial colourings. We have included natural vitamin oils and raw English honey to form our lip balm that soothes and protects your lips from the elements. Now comes in a handy pocket size (completely recyclable) tin! Smells and taste so good you’ll be tempted to eat it-but don’t, just enjoy it on your lips! Made with our own combination of pure hydration oils, honeycomb and real fresh royal jelly. Royal jelly is a highly nourishing skin food which aids elasticity and moisture to dry skin, thus helping to minimise lines and wrinkles with great results. We do not used any artificial colourings. Not tested on animals. A advanced blend of sandalwood and cedarwood essential oils gives our moisturiser a warm sensuous scent . Not tested on animal, no synthetic or artificial waxes or boost blenders. A small amount of our cream goes a very long way, apply sparingly. Facts: Royal jelly is not a manufactured drug, but a natural food made up of all the essential nutrients of life itself. Royal jelly is a creamy, white substance secreted by young nurse honey bees from their Hypopharyngeal and Mandibular glands. Royal jelly is very rich in nutrients and multi-vitamins. It contains all of the B-complex vitamins including a high concentration of pantothenic acid (B5) and pyridoxine (B6), and is the only natural source of pure acetylcholine. Royal jelly also contains vitamins A, C, D, and E, proteins, 18 amino acids, enzymes, minerals and many others. A truly unique hand soap! Made with real honey. It lathers up to a rich texture and is mild honey scented. Comes shrink wrapped for freshness. Made with real honey. 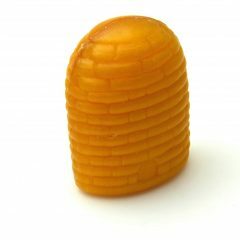 This bath soap is in the shape of a ‘skep’ beehive. It has a warm scent of honey. It comes shrink wrapped for freshness. Wonderfully rich and gentle soap with sprinkles of lavender and honey. Made in England.